GATINEAU, Que. 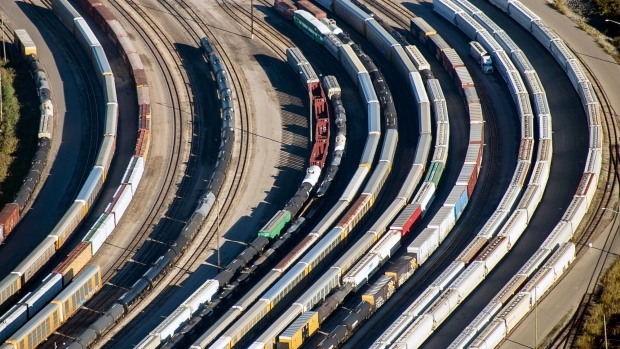 -- A preliminary report from the Canadian Transportation Agency lays bare the recent dispute between railways and shippers, including accusations of "discriminatory treatment" against some commodities and the use of embargoes. Drawing on interviews and data, the report reveals exceptionally high embargo numbers in the Vancouver area over the past two years, with some shippers claiming Canada's biggest railways imposed them "in an effort to push through the maximum overall volume" at the expense of forestry products and other commodities, the report states. At Canadian National Railway Co. (CNR.TO), shipments of grain, chemicals and containerized loads between October and January have mainly gone up over the past four years, while forestry product volumes went down 11 per cent, the report shows. Canadian Pacific Railway Ltd. (CP.TO) imposed no embargoes in the October-to-January period for three straight years, then issued three embargoes in the past three months. CN issued a combined 20 embargoes during that three-month period in the past two years -- nearly seven times the number it issued during the same period in the two years prior. The report, launched last week following complaints from shipping associations, also notes overall volumes in the Lower Mainland have increased 15 per cent in that three-month period since October 2015 for CN, and 19 per cent for CP, straining supply networks as demand for Canadian commodities continues to grow in Asia. The report comes ahead of a two-day hearing next week, with presentations scheduled from both railways and several shipping associations following recent congestion problems in the Vancouver area.